The Pentagon is involved in organizing war games in different part of the World. The stated military mandate is national security and the “Global War on Terrorism”. The South African media has reported the holding of military exercises involving the US military and the South African National Defense Force (SANDF). The joint war games are to be coordinated by USAFRICOM’s “US Army Africa Contingency Command”. “SA Navy Captain Jaco Theunissen said the militaries would share technical expertise during the exercise, which would start on 24 July and end on 5 August, and would involve 5 000 soldiers. “We are exercising to do a human support intervention in an unstable country,” said Theunissen. “What we simulate is what is currently happening in a lot of countries in the world, especially in the African continent. Medical units would also practice giving basic medical healthcare to a local population in an unstable warring environment. What these official statements imply is that The Republic of South Africa is slated to participate in US-NATO sponsored “humanitarian interventions” directed against other countries in sub-Saharan Africa, which have been tagged by Washington as “unstable nations”. What is not mentioned is that these so-called “unstable nations” are invariably the object of a US engineered political and economic destabilization process (including the imposition of deadly IMF-World Bank economic reforms), which create conditions for the “recolonization” of sub-Saharan Africa. 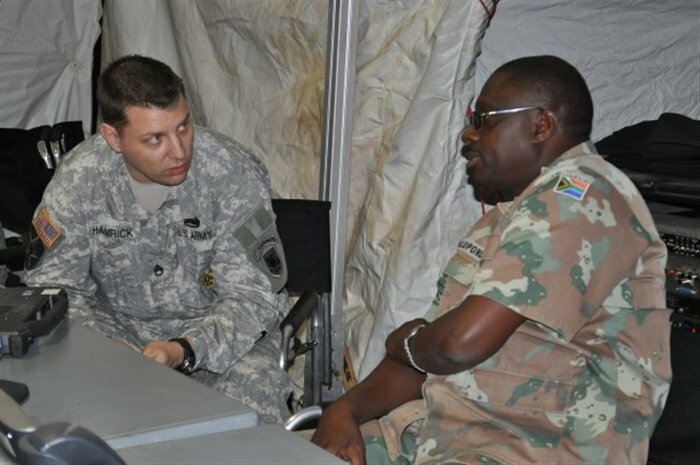 Col. Vuka Sean Mahlasela, 44th Parachute Regiment commander, South African National Defense Force, or SANDF, said the exercise helped both forces learn to cooperate with each other and improved the relationship between U.S. and South Africa. “Joint and multinational operations have become the norm of the day. The national defense forces play a very significant role to be able to operate with regional, international and multinational forces to test tactics and share skills and knowledge as well as to learn from each other as multinational forces,” Mahlasela said. While the stated purpose of the war games is to “protect Africa”, the real objective is imperial conquest. Washington’s hidden agenda is to “make Africans fight Africans”. It is worth noting that the SANDF was recently involved in fighting rebel forces in the Central African Republic, in which 15 SANDF soldiers were killed. The SANDF is supportive of US hegemonic objectives in Africa. By collaborating with the US in joint military operations, the South African National Defense Force (SANDF) is, in some regards, playing a similar role to that of the SADF of the Apartheid period. In April, the US completed a two-month-long ‘Foal Eagle’ exercise military exercise in Korea involving several thousand air, ground and naval personal. The objective was to trigger increased tensions on the Korean peninsula. On July 18, the US commenced the largest joint war games in Australia’s history involving 20,000 US troops. The military exercises –which are part of the Pentagon’s “Asia Pivot”– are being staged on Australia’s eastern seaboard. The Obama administration’s so-called “pivot to Asia” involves the repositioning of American military forces throughout the Asia-Pacific region as well as strengthening US military alliances and strategic partnerships in that part of the world.In order to display its military might, the Pentagon leads multinational military exercises each year in the Asia-Pacific region, which is a “very dangerous escalation of US military presence,” Rozoff said. Rozoff described the US military as “out of control” that needs to be disarmed and pacified by the international community.